These monumental planters are gorgeous! Don't let these planters pass you up. Over 8 foot tall and the bases around 2' x 2' imagine the possibilities. Wear consistent with age and use. Minor fading. Some items may require special handling and packaging. Request a shipping quote to see what options are available to your destination. Generate an invoice that you can customize and print. Beautiful curves make up this Italian hammered brass planter with a pair of handles. The piece is marked on the bottom with the number 1240 and solid brass. Made in Italy. 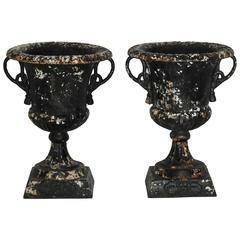 The classical style antique lead planter has a drainage hole and is decorated with swags and urns. Three sculptural planters, designed by Willy Guhl for Eternit Ag, Switzerland, circa 1960s. They retain their wonderful original patina. The price noted below is for one planter. A nice Art Nouveau planter from the Belgian architect and designer Gustave Serrurier-Bovy (1858-1910). Very good condition. The planter is re-painted in it's original color.